Democrats should ditch commit-to-vote (CTV) pledges for vote tripling pledges. 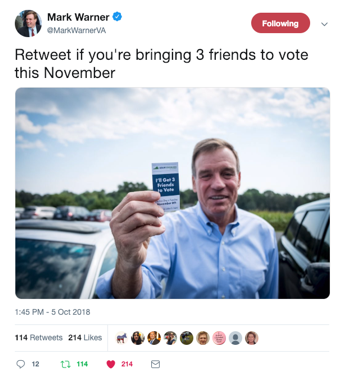 Instead of asking Democrats to commit to vote, campaigns should ask them to pledge to get three friends to vote. Relative to commit-to-vote (CTV) pledges, new evidence suggests voters like ‘vote tripling’ pledges more and that these pledges more effectively increase voter turnout. Last year, innovative campaigns piloted various ways to get non-activist Democrats to take vote tripling pledges and developed a suite of best practices for future vote tripling campaigns. 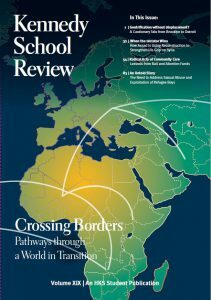 Democratic campaigns can use vote tripling to win 2019 races as well as to refine this new voter turnout technique in advance of 2020. Vote tripling feels less condescending than a CTV pledge. When using CTV pledges, campaigns first ask if the voter intends to vote for their candidate. If so, the campaign will then ask them to sign a pledge confirming their intent to vote. As a result, commit-to-vote pledges signal to voters that the campaign sees them as a liability. For instance, a voter once responded to me saying, “C’mon man. Do I really have to do this? I just said I’d definitely vote.” Conversely, pledges to get three friends to vote signal that the campaign sees the voter as a leader. A recent online survey confirms this idea. In the test, VoteTripling.org asked 228 non-activist Democrats to imagine a pleasant conversation with a canvasser ending with an ask to complete a pledge. Subjects randomized to imagine being asked to pledge to get three friends to vote reported that the ask felt far less condescending than subjects who imagined they were asked to complete a CTV pledge. These pledges also differ in how they affect turnout. Vote tripling likely boosts turnout more than a CTV program because vote tripling pledges appear to net more votes per pledge. Preliminary evidence from a 2018 test by VoteTripling.org suggests vote triplers make their friends 10 percentage points more likely to vote early, meaning each vote tripler produces 0.30 votes. In comparison, a CTV pledge generates just 0.03 votes. Further, analysis indicates that vote tripling programs have similar rates of favorable responses as CTV pledges. Campaigns get roughly 20% of the supporters they ask during canvasses to pledge to vote triple. Veteran campaigners tell me this conversion rate roughly matches that of CTV programs. 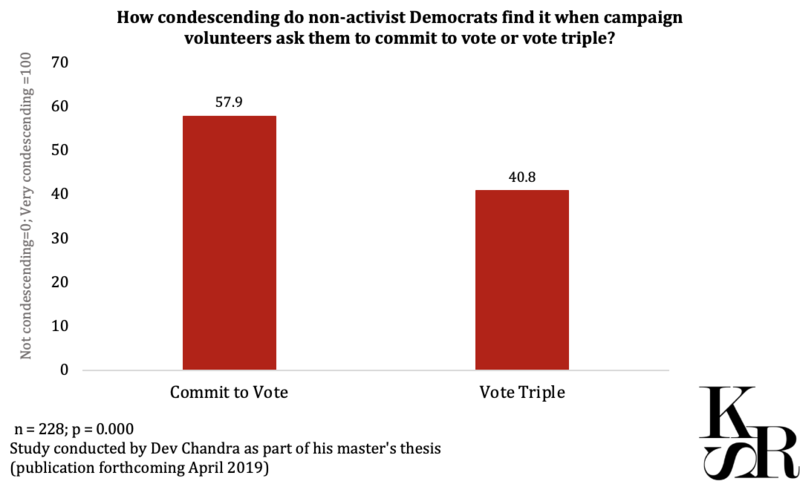 Vote tripling is custom-designed for “non-activists” (the 97% of Democrats who vote, but don’t volunteer for campaigns). For instance, this technique’s design is based on research finding non-activists only want to mobilize roughly three friends, usually won’t download relational organizing apps, and can boost a campaign’s total turnout by up to 12%. 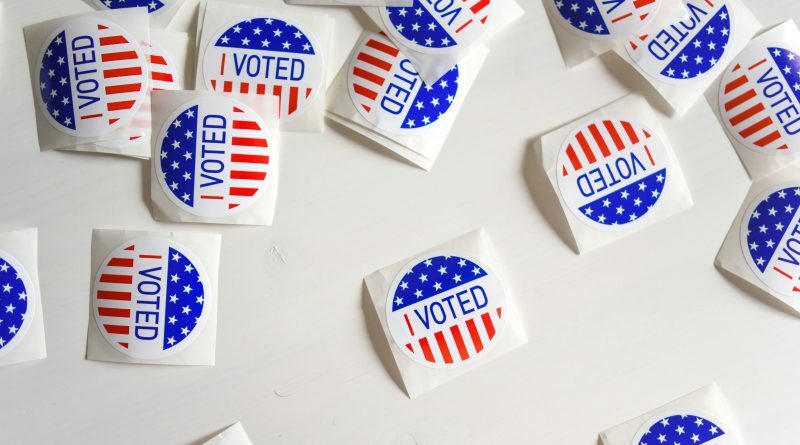 Because vote tripling isn’t a technology, but rather a free and open-source process for collecting pledges, campaigns have unlimited ability to customize how they implement this strategy. As one example of vote tripling’s customizability, four non-partisan organizations in Montana added a vote tripling pledge question to a voter registration drive at a pre-concert festival last August. In just two hours, their volunteers crowd canvassed the event and got over 3,200 vote tripling pledges. Traditional door-to-door campaign canvassing is another way to obtain vote tripling pledges. The Leslie Cockburn for Congress campaign (VA-5) initially collected pledges during canvasses using business card-size sign-up cards and had volunteers return the filled-out cards to the campaign office. But, as things got busier, they streamlined their process by adding a space next to each voter’s name on canvassers’ walk sheets for volunteers to record vote tripling data. Emily Doran, the campaign’s Field Director, told me they then sent each of their roughly 3,300 vote triplers multiple SMSs before Election Day reminding them to urge their friends to vote. In sum, this simple ask tacked onto their canvassing program may have resulted in nearly 10,000 voters receiving a personalized, perfectly-timed nudge to vote from a close friend. Campaigns also collect vote tripling pledges through text banks, the modern version of phone banks. In one night, the Vanessa Aida for Congress campaign (TX-12) texted registered Democrats and got over 1,800 to pledge to vote triple. When texting voters, they followed simple instructions published by Hustle for signing up vote triplers via SMS. Sara Fairley, Ms. Adia’s Deputy Campaign Manager, explained it “only took us a few hours in total” to sign up voters and send reminder text messages during the early voting period and before Election Day. Community events, canvassing, and direct SMS outreach are just a few examples of the ways campaigns can enlist supporters to serve as micro-relational organizers. It’s also time-efficient for activists in low-voting-propensity communities to serve as “vote bundlers,” which involves (i) deputizing them to get dozens of peers to pledge to vote triple and (ii) having the “vote bundler” return the lists of vote triplers back to the campaign so each of them can get a personalized SMS reminder. Vote tripling is a light lift, but it requires training volunteers up front and making sure to celebrate when they succeed. Ms. Doran of the Cockburn for Congress campaign shared with me that her campaign had leaders across their district attend a get-out-the-vote (GOTV) training with a 20-minute vote tripling training. During this training, activists learned how to pitch vote tripling to voters and then went back and trained their local Democratic Committees in the practice. It was equally important, Ms. Doran expressed, that their canvass captains, phone bank captains, and staging location directors kept the importance of vote tripling top-of-mind among volunteers by celebrating with volunteers each time they collected pledges. Another best practice involves integrating vote tripling pledge metrics into campaign progress-to-goal (PTG) reports. After adding vote tripling pledge counts to their PTG reports, the Leslie Cockburn campaign saw the number of pledges they collected grow exponentially each week. VoteTripling.org created a simple tool to help 2019 races estimate PTG metrics. This tool helps campaigns plan a customized vote tripling program and estimates how many additional votes they’ll win via vote tripling. For instance, the tool projects campaigns who copy the Leslie Cockburn campaign’s methods and start 120 days before Election Day will see a 3.7 percentage point boost in voter turnout. Ditching commit-to-vote pledges for vote tripling is a win-win. In 2019 elections, Democrats should use vote tripling to get more votes and create a better image with their constituents. These strategies will be particularly important in locations with statewide elections such as Kentucky, Louisiana, Mississippi, New Jersey, and Virginia. If field operatives in these states use vote tripling well, they may become some of the most valuable and highly-sought after campaign staff for 2020 presidential primary campaigns. 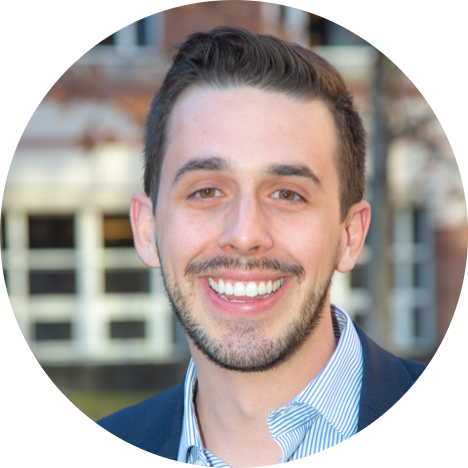 Robert Reynold is a behavioral scientist who designs free GOTV programs that spark people to get their friends to vote. As Co-Founder of VoteTripling.org, he’s trained dozens of campaigns and voter turnout organizations and has got tens of thousands of voters to take his non-profit’s “I’ll get three friends to vote” pledge. He was trained in behavioral science at ideas42 and the Harvard Kennedy School, where he worked under experts in behavioral science and voter turnout. Robert is from rural Montana and lives in Washington, DC.